Luchina Fisher is a journalist who has covered entertainment for ABC News for the last 10 years. In my 11-year-old’s careful handwriting, it read: "Dear Mother and Father, can we move to a different country because I think I don’t want to be a boy lots of times ... We’ll discuss later." There were many things that struck me all at once: the formal salutation, the question of moving to another country and, in my line of work, burying the lede -- that part about not wanting to be a boy lots of times. All at once I wanted to fold my child into my arms and bury myself in my husband’s chest. That G had not wanted to be a boy was not the most shocking. What rocked my world was that G had obviously been feeling that way for a long time and, despite my husband David and I creating an open and supportive home environment, still struggled to tell us. From the moment G put on my shoes at age 2, we suspected G was not like other boys. Before Gia transitioned at age 3. Walking in Daddy's shoes is a rite of a passage for most toddler boys. But G was only interested in my shoes -- the higher the better. Soon, G was turning my shirts into dresses. By the time G was 4, we were convinced this was more than just a phase. When I was a little girl, my mom used to get me and my sisters a new pair of shoes every Easter. We’d pair our shiny new shoes with tights or ruffled lace socks and a new outfit for church. Now G was demanding a pair of Easter shoes. David and I took a trip to Payless with G and G’s little brother. G was excitedly trying on shoes in the girls' shoe aisle when a family we knew in town spotted us in between the racks. There was an awkward "Oh hey, you’re shopping for shoes too," before they headed for the boys’ section. G, who had found the perfect pair of white Mary Janes, was oblivious to the whole exchange. 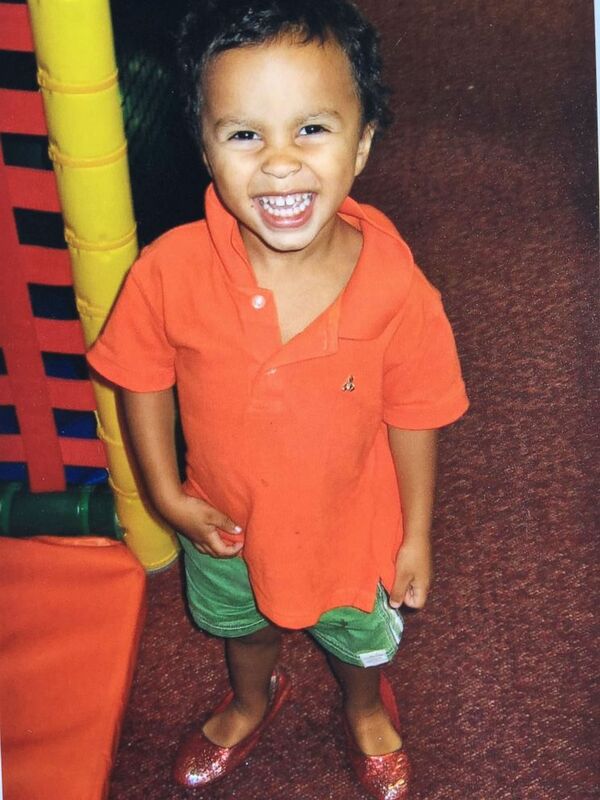 The next day, G flaunted those white shoes at a friend’s Easter egg hunt. Even a little boy asking out loud why G was wearing girls’ shoes did nothing to dampen G’s excitement. For the next year, G wore the shoes at home and in the neighborhood and at her best friend Lily’s house where they spun around in princess dresses. G wore those shoes until the buckles came off. But sometime before starting kindergarten, G, without explanation, stopped wearing girls' clothes outside the house. G was still a boy who liked girls' things, but now G was keeping a "secret" from most people outside of our immediate family. That secret stayed hidden from all but two very close friends until just before G started eighth grade. After my husband and I sat down with G to talk about the note, it became clear that G had been struggling for some time and had grown weary of keeping secrets and "faking" life as a boy. The only way for G to feel whole and bring together her inner and outer selves, her public and private lives, would be to socially transition. Yet, G was terrified of coming out. The biggest fear: being rejected. In our small New England town, G had been in school with most of these kids since first grade. Everyone knew G, but none knew the secret G had been hiding. Zoe, the one friend in town who did know, had moved to the U.K. the year before -- hence G’s desire to move to another country. Moving out of the country was out of the question. We weighed the possibility of sending G to another school to start over, with a new name and a new identity. But going "stealth" would mean G carrying yet another secret. More than anything, G wanted to be free. So toward the end of G’s seventh-grade year, we embarked on preparing G to socially transition at the start of eighth grade at our town’s middle school, where G would be the first. The school and the superintendent were determined to do this right. The entire middle school staff would go through training, and David and I would meet with G’s teachers before school started. When G was ready to go public, everything would be in place. "Have you told any of your friends yet?" the principal asked G. The answer was no. There were so many things to figure out: clothes, hair, a new name. That summer, G tested the waters at sleepaway camp and on an extended family vacation and reunion. Watching our son transform into our daughter, from G to Gia, was like the pieces of a puzzle shifting into place. Gia had never been happier or more comfortable in her own skin. The social awkwardness and second-guessing were replaced by a newfound confidence. Gia was blooming. 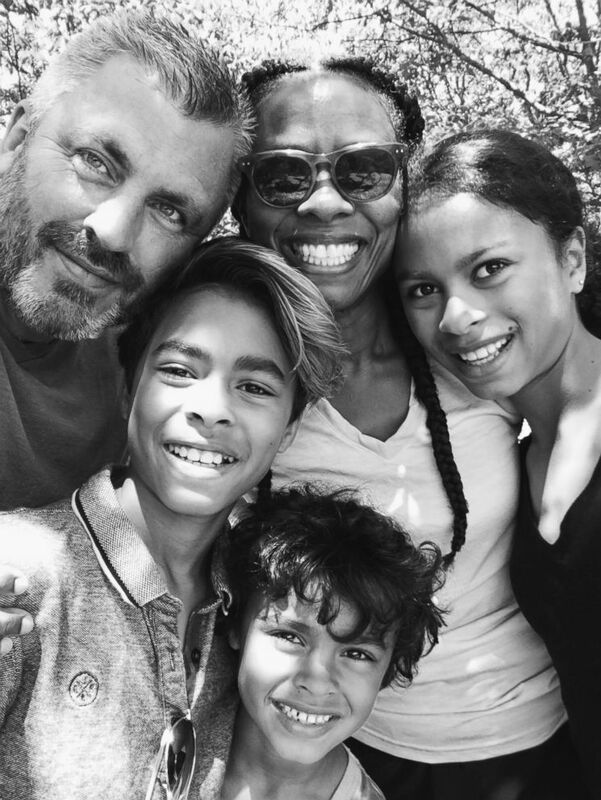 Gia with her family, the author, husband David and their two sons, Luc and Mateo. Back home, Gia went back into hiding, still not ready to go public and uncertain of how to tell her friends. Those couple weeks before school started were an excruciating time for all of us -- filled with doubt, anxiety and fear. Maybe we should wait until high school? As terrified as she was, Gia couldn’t wait any longer. We decided the best way to tell everybody was all at once. David and I would send a letter to the entire middle school two days before school started. Gia was still stuck on how to tell her friends or even who to speak to first. The principal then offered to host a lunch for Gia and her closest friends the day before school started. She loved the idea. We sat down to compose one of the most important letters of our lives: "We are writing to share with you that G is transgender. Very few people outside of G's family have known, but in recent years it has become increasingly difficult for G to keep this inherent part of himself hidden. So G is transitioning from male to female and will attend school this year as a girl. She would like to be called Gia." The letter stressed how Gia has the full support of extended family, doctors and the school, and that this is "absolutely the best decision for Gia." "Making this step requires Gia to be brave and courageous -- and she cannot do it alone," we wrote. "We ask that you be respectful and supportive of Gia and remember that while Gia’s outward appearance may change, she is otherwise the same person with the same personality, humor and interests." The letter concluded by thanking everyone for supporting us on Gia’s journey and it was signed by our whole family. Emails and text messages poured in from parents we knew from class parties, soccer games and the local Starbucks. "Congrats," a mom of two boys wrote. "You now have a girl in the family:)"
"Good morning," wrote a mom whose daughter had known G since first grade. "I just read your letter and wanted to send you all a big hug and especially Gia. So proud of her!" Then, she wrote, "This may be a silly question, but what size does she wear and does she need or want any hand-me-downs." I quickly texted back, "Yes!" Gia’s phone lit up with text messages of love and support from friends, and new requests from kids wanting to follow her on Instagram. Sitting on the kitchen floor, her phone buzzing, she shrieked that her social life was getting bigger, not smaller. The next day, 10 girls showed up at the school for lunch with Gia -- the first time anyone from town would be seeing her. The girls embraced her in a group hug even before Gia made it to the front door. Together, they spent the next two hours talking nonstop over pizza and soda in the school library. Every fear we ever had never materialized. The first day of school passed without incident, as have all the days since. Instead, we were blown away by how seamless the transition was. A week later our house was filled with 12 boisterous teenage girls for Gia’s 13th birthday party. The co-ed cross country team she’d run for since fifth grade welcomed her back with open arms and made her captain of the girls' team, which she helped lead to one of their best seasons while making all-conference and all-state. Gia has always been an A-student but now her teachers were saying how happy she seemed in class. Gia is seen here with the author and her husband David. I was surprised at how relieved I felt, not realizing until then the weight I had carried all those years. On the eve of 2017, I took a moment to share "my little bit of goodness" about how our community had been so accepting with a post on Facebook’s Pantsuit Nation. "Gia’s smooth transition is my little bit of goodness in the world," I wrote. "That she could find the courage to be her true self at age 12 fills me with awe and pride." Attaching a photo of Gia at age 3, I wrote, "I’ll never forget the day when G was three and we visited an indoor play space. G found a pair of ruby red slippers, slipped them on and beamed. Like Dorothy in ‘The Wizard of Oz,’ Gia has already discovered that she has the power to create the life she wants -- and that power is as close as the shoes on her feet. Only now, she doesn’t have to put on my shoes or a pair of play slippers anymore. She’s got her own shoes and she’s filling them perfectly." Gia is part of a new national storytelling campaign called The GenderCool Project. 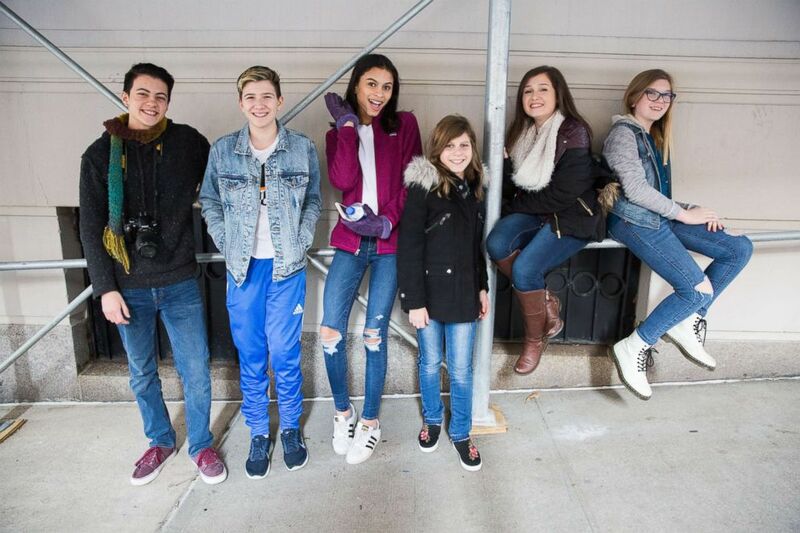 Seen here with from left, Landon, Daniel, Gia, Chazzie, Nicole and Stella. 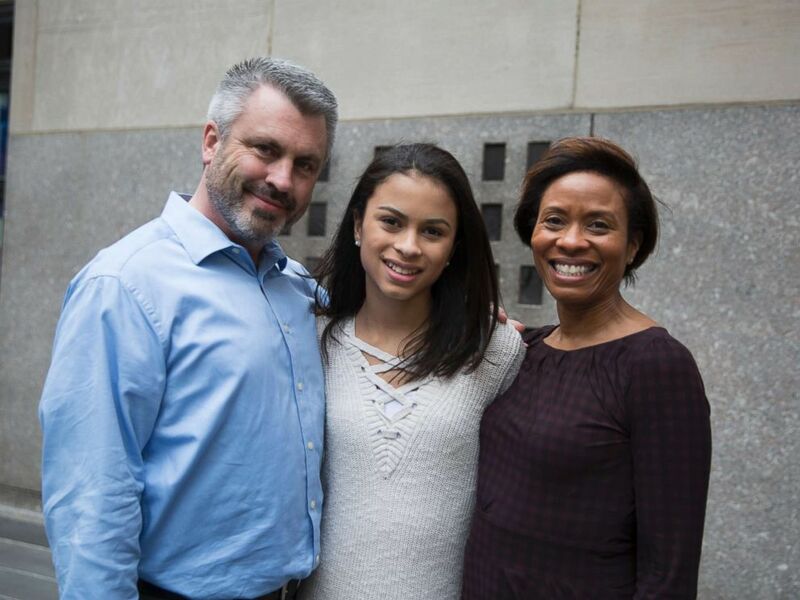 Today, more than a year after her transition, Gia, a 14-year-old high school freshman, is stepping into the shoes of role model. She and four other transgender teens from across the country are helping to launch a new national storytelling campaign called The GenderCool Project, which aims to show who transgender and gender-expansive youth are, not what they are. "People need to see how remarkable these kids are," co-founder Jennifer Grosshandler said in the group’s press release. "That’s how we build understanding. There is no lack of stories about the difficulties these young folks are going through. But I’ve met so many powerful, smart, talented young people. They are musicians. Athletes. Future politicians. Business leaders. Broadway actors. And I’m asking, ‘Who’s telling their stories?’"
As someone who tells stories for a living, I know the inherent power of stories to change hearts, minds and lives. I’ve seen it happen within our own family and small town. As these GenderCool champions share the story of who they are on the anniversary of the Trump administration revoking federal guidance to fully protect and support transgender students in schools, they are living examples of what’s possible when there is love and support from families, schools and communities. Gia has always been a champion to us and we will always be her champion.